When I first heard that Yemen has local athletes and teams, I thought it must be a rumor. We have a sports culture? The only part of the body I see people exercising is their mouths—moving it up and down to eat, talk, and chew qat! As for athletes, we never see them, but we hear about them when we get beaten 8 – 0. We only hear about the zeros, we never see or hear about wins. To be honest, we were shocked when we learned that there were Yemeni athletes representing us in Judo, Taekwondo, and running in the 2012 London Olympics. We’ve asked people in the street to name a Yemeni athlete in basketball, tennis, volleyball, or football. Seven out of 22 named the football player Ali Al Nunu, one remembered Naseem Hameed, and the rest were not able to name any. However they were all able to name foreign players, they knew football players, tennis players, boxers and basketball players. 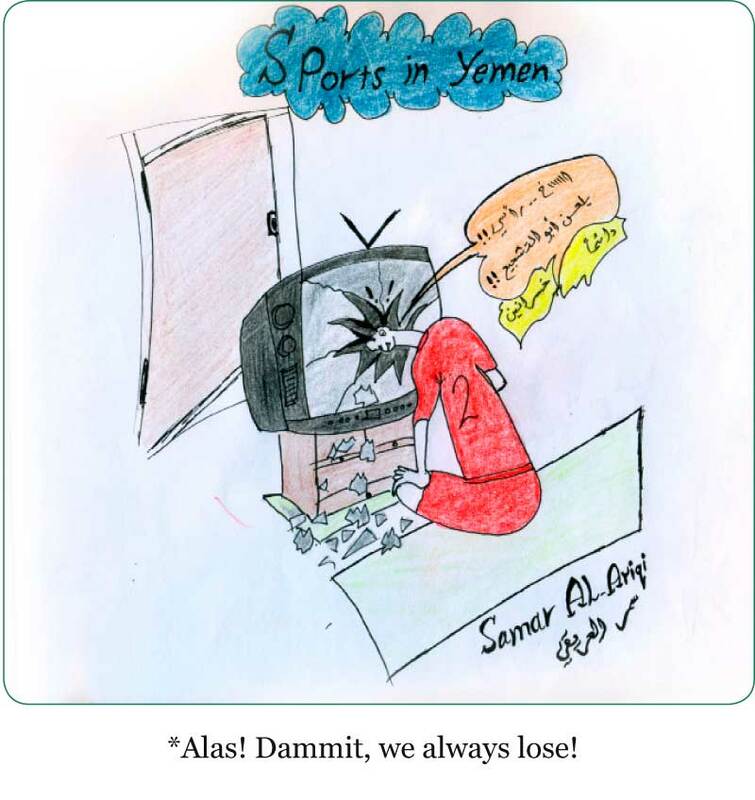 Yemenis loves sports. Maybe we’re just too busy to do any ourselves. Between studying, working, and chewing qat, time passes quickly. From the morning till the afternoon they’re busy, from the afternoon till sunset they’re chewing, and from sunset till the next day they’re out of coverage! As soon as someone says that he wants to start playing sports, everyone starts making fun of him. If people saw a man jogging in the street, they’d think he’s either crazy or a thief, and they will start running after him. Our teams need to train, train and train more. If you open the TV and come across a channel covering a sports event, you’ll think that the camera was playing in slow motion, they’re unfit turtles! Football fields in Yemen, look like the moon. They’re full of holes, and uneven surface. The aim of these courts is to make players fall and get hurt. And of course we don’t have proper health insurance systems, if our players get hurt, they give them couple of hundred dollars and a plane ticket, and they fly to get medical treatment abroad. Once they arrive, they find out that their treatment will cost thousands of dollars. They sell their cars, houses, and gold, in order to complete the treatment, and say bye-bye to their sports career. I just want to know, where does the YR4 billion allocated for the Youth Development Fund go? Sports clubs are either a wreck or closed. If you hear sports officials speak, you can tell that they have no idea what they are talking about, they might be experts in politics or selling potatoes, but definitely not talking about sports. We need people who understand sports, who live, eat, and breathe sports. The Ministry of Youth and Sports clearly employ the wrong people in the right places. I just want you to point out one person in the football or any other union who was a former player, or has even played any form of sports. In this ministry, “vitamin w”—wasta—plays a huge role. They don’t even try to hide it. How do you want us to progress and compete in this industry and the people in charge have nothing to do with sports. Where did sports classes in schools go? How are we supposed to encourage more people to get into sports, become fit, and live a healthy lifestyle if we don’t start from schools? I’ll tell you how the new generation is going to turn out: fat women, men with big bellies, and lazy children. If you get the youth into sports, and athletics, they will turn their backs on many bad habits, such as smoking or chewing qat. It’s not like Yemenis do not watch sports, or do not support teams, they do watch and they do support, but not their own teams. When are we going to become like the Spanish, British, or Egyptians? They have teams that the whole world supports. No one cheers for Yemeni local teams except their families or friends. Dear sports officials who are running this ministry. Advertise for tournaments and matches—whether in football, karate, tennis or basketball. Take care of our athletes. Sell tickets, run sports events that are open to the public, encourage people to come and support teams. We need to create a generation that is more fit—not less—than the present one.